Playdough is one of the best value-for-money toys for young kids. It’s great for sensory and fine motor development, hands-on exploration, creative and imaginative play, storytelling, the introduction of basic scientific and engineering concepts and great for play dates and parties too. Is It Safe for Kids to Eat Playdough? Okay,…don’t panic if your child accidentally or deliberately eats the playdough. Homemade playdough is pretty safe to consume in small amounts (note: due to the amount of salt in homemade playdough, you should not allow pets to eat it). Obviously, if you decide to add ingredients like glitter powder, the playdough will no longer be safe to consume. Store-bought commercial playdough is non-toxic but as much as possible, you should try to avoid letting your kid eat them. Commercial playdough is like homemade playdough except it has preservatives too. The most famous commercial playdough brand, of course, is Play-Doh. The great thing about Play-Doh is that they are not expensive and come in such great colors. If you are time-poor, it’s a lot easier to buy Play-Doh rather than make them yourself. Not to mention that having the option to buy playdough, as opposed to making them yourself, is helpful if you are not very confident about your skills in the kitchen or just couldn’t be bothered. There are many different ways to make playdough and there are some really great recipes out there. In general, the recipes can be divided into cooked and uncooked methods. Cooked playdough normally requires cooking over a stove top, microwave or use of boiling water (which cooks the playdough). Uncooked playdough just requires ordinary mixing in a bowl. Has a better texture- more pliable and squishy. Uncooked versions tend to break into crumbs more easily when pulled apart. Kids can get involved with the entire process of making the playdough as there is no dangerous step involving boiling water. Can last almost as long as the uncooked version if it’s refrigerated and packaged well. How Long Can Homemade Playdough Last For? Cooked versions can last for approximately 6 months. You don’t have to refrigerate the playdough but you should keep it in an airtight container, resealable bag or plastic wrap to keep it from drying out. For uncooked versions that are not refrigerated, they tend to only last a few weeks. If you refrigerate them in an airtight container, resealable bag or plastic wrap though, they can last almost as long as the cooked versions. This is our favorite homemade playdough recipe. To keep it basic, you can ignore the optional ingredients. To make it as fancy as you want, add the optional ingredients or your choice as listed below. Mix the flour, cooking oil, salt and cream of tartar in a large bowl. Add food coloring to the boiling water in a separate bowl. Pour the liquid mix into the first bowl. Stir continuously until you get a sticky dough. Add the glycerine drops, essential oils and glitter powder if desired. Allow dough to cool down. Remove the dough from the bowl and knead it on a flat surface for a few minutes until the stickiness has disappeared or you obtain your desired texture. Tip: If the dough is too sticky, add more flour. If it is not sticky enough, add more water.. If you have a child who is allergic to gluten, don’t use playdough recipes that use ordinary flour as gluten is found in wheat and other grains. Instead, try these gluten-free homemade playdough recipes instead. Alternatively, you can also just buy gluten-free and natural aroma versions. If you have accidentally left the playdough out for too long and it has turned hard, you can try to revive or soften the playdough. To soften or revive playdough again, break it up into small pieces (as small as pea sizes if you can) and add a drop of water to each piece and knead them all together until they reach the consistency that you desire. If you are new to the world of Play-Doh, you may not be aware of the variety and versatility of Play-Doh. The amount of new things that have been created to extend Play-Doh play is humongous. Here are some of the ones that we think are awesome. 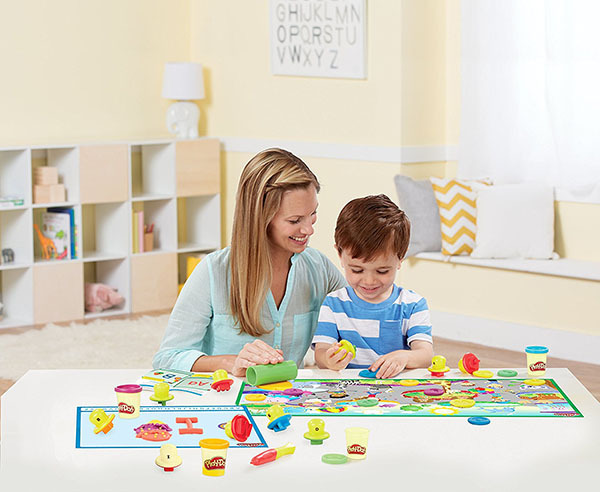 The Play-Doh Fun Tub is a great starter set for a child new to Play-Doh. This set comes with 5 tubs of Play-Doh and 20 tools including a 2-piece extruder with rail, a knife, a rolling pin, 3 stampers and 12 cutters. Great value for money if you are not quite sure how your little one will take to Play-Doh just yet. The Play-Doh Shape and Learn Letters and Language set is great for toddlers who are learning their alphabets. This set makes alphabet lessons a lot of fun. This set comes with stamps for all the letters of the alphabet and 2 double-sided playmats. The idea is for your toddler to stamp out the alphabets and place them on the corresponding alphabet spot on the playmat. In addition, this set also comes with a stylus-like pen and a roller for flattening out the Play-Doh. Highly recommended for young toddlers. Comes with 6 tubs of Play-Doh. 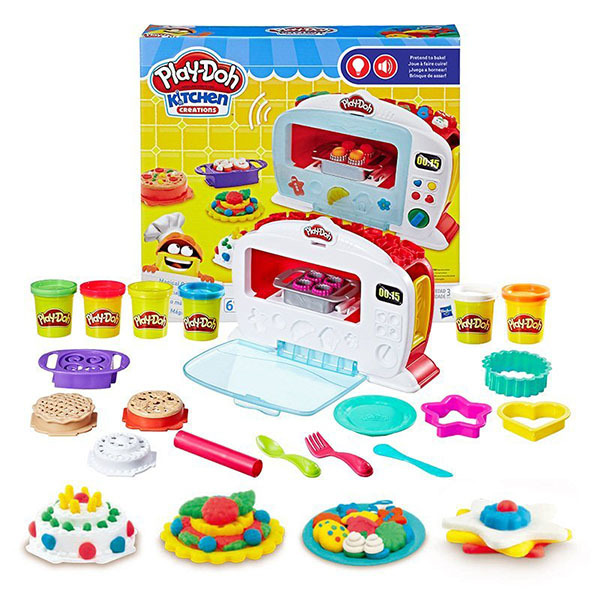 The Play-Doh Kitchen Creations Magical Oven has been designed so that it mirrors real food cooking in an oven. Your child loads Play-Doh into the oven, closes the oven door and presses the lever which pushes the Play-Doh up, mimicking rising dough. Simultaneously, there is a white light in the oven that switches to red with a “ding” sound when your child has completed the pressing. This mimicks a real oven that has completed its baking time. Clever, right? So clever that it was a finalist of the 2018 Toy of the Year Award! There are a lot of yummy goodies that your child can create in this oven including muffins, pizzas and cakes. This set comes with 5 food attachments, 3 cutters, a knife, fork, spoon, plate and roller. This set comes with 6 tubs of Play-Doh to create yummy food with. If you have ever hoped that your child would aspire to be a dentist, the Play-Doh Doctor Drill ‘n Fill Retro Pack is definitely THE toy to get your child. In many ways, there is a lot of likeness in the way this Play-Doh set has been designed to mirror what a real dentist does. It comes with an electric drill that makes actual drilling sounds, a toothbrush, mirror, tweezers, tooth mold and a comical human head to perform the drilling on. Your child can practice filling cavities, making braces and brushing teeth on this human head. Come to think of it, this would be a perfect toy to use to teach a child about brushing his or her teeth, as well as to talk about the dangers of sugar. This set comes with 5 tubs of Play-Doh. 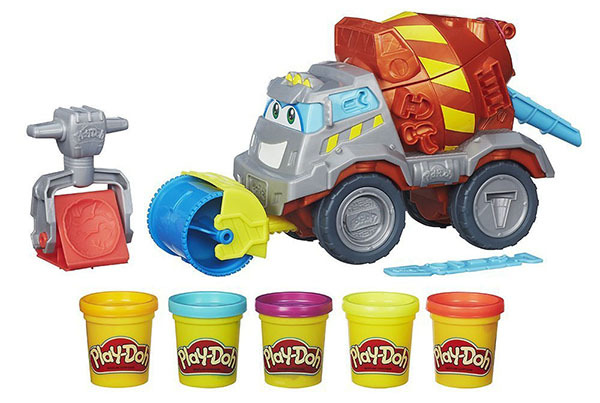 The Play-Doh Max The Cement Mixer is a great set for kids who are fascinated with construction sites, cement mixers, manholes and orange road cones. The cement mixer looks like a regular truck but it squirts Play-Doh out the back. The truck has a leveler out in front to create Play-Doh roads. There is also a jackhammer with 3 attached stamps. Comes with 5 tubs of Play-Doh. 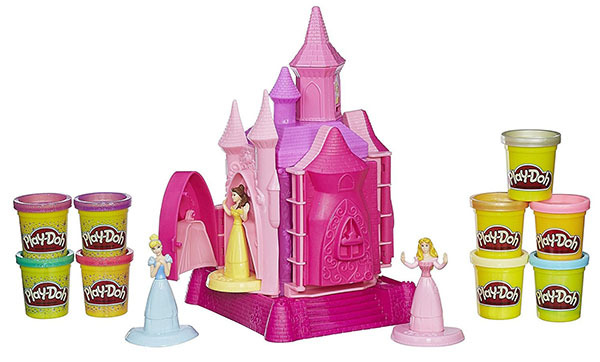 Okay, we admit that we are a sucker for the Play-Doh Disney Princess Prettiest Princess Castle Set (Amazon Exclusive). It just looks too pretty and fun to ignore. That is if you love the Disney princesses! This set comes with 3 princesses; Cinderella, Belle and Aurora but you can also change another princess to become Rapunzel by using a press that creates Rapunzel’s long hair. The princes’s castle doubles up as Play-Doh molds. Your child can choose what color dresses they want their Disney princesses to wear. Your child also gets to create and dress the princesses in Play-Doh clothes and accessories including tiaras, hair bands and glass slippers. And because every princess deserves a prince, there is also a prince mold so that your child can create their own romance fairytale. The Play-Doh Diggin’ Rigs Buzzsaw Playset is fantastic for kids who love trucks and sawing things. This set comes with a truck with a buzzsaw arm that acts like a crane and can also be removed separately for play. There are 2 plastic blades for shaping and sawing and an extruder rail too. Your child can pretend that he owns a lumber mill or forest and cut up logs while navigating a tricky construction site. Comes with 4 tubs of Play-Doh. Play-Doh is not the only company that produces quality tools to use with playdough. Below are 4 different sets of playdough tools. 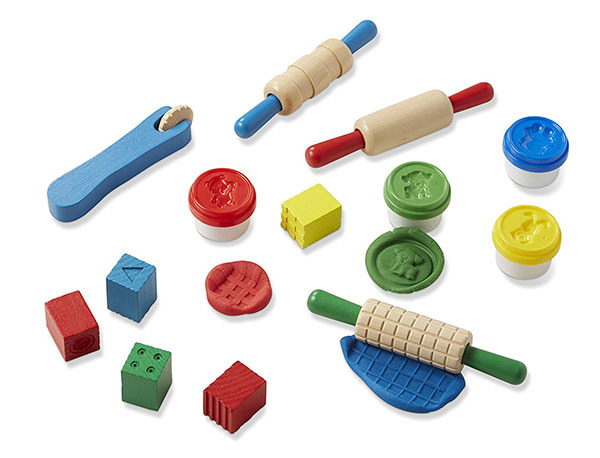 Melissa & Doug produce some quality wooden tools to be used with playdough. 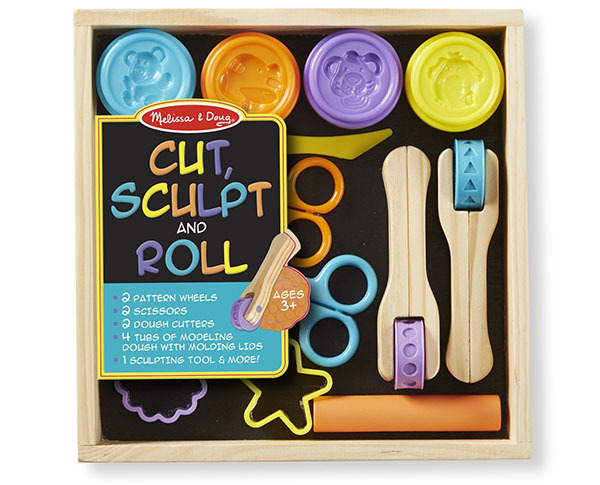 This set comes with sculpting tools including 3 rolling pins, 1 wheel press and 5 stamp cubes. This set also provides you with 4 tubs of dough that have a different mold printed on every container lid. This set is very similar to the above but it also contains straight scissors and a zigzag one. If you don’t mind using plastic tools, this set is a great value and comes with 29 tools that your little one can use with playdough. The models and molds include shapes of flowers, people, animals and shapes. We especially like this set because it includes 5 extruders which are normally the most popular tools in any set. These extruders will help your child produce long pasta-like creations in the shape of a heart, star, spaghetti, lips and flower. It also comes with a big rolling pin, a smaller rolling pin, a roller, a knife, a circular lace knife and around pizza-cutting knife. 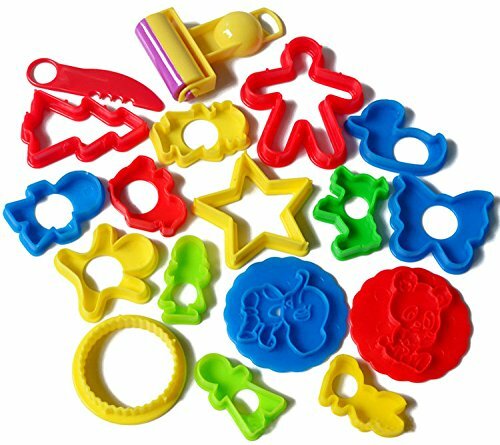 This is another great playdough toolset. This set comes with 24 pieces that your little one can use to create shapes, human figures, animals and other things with. 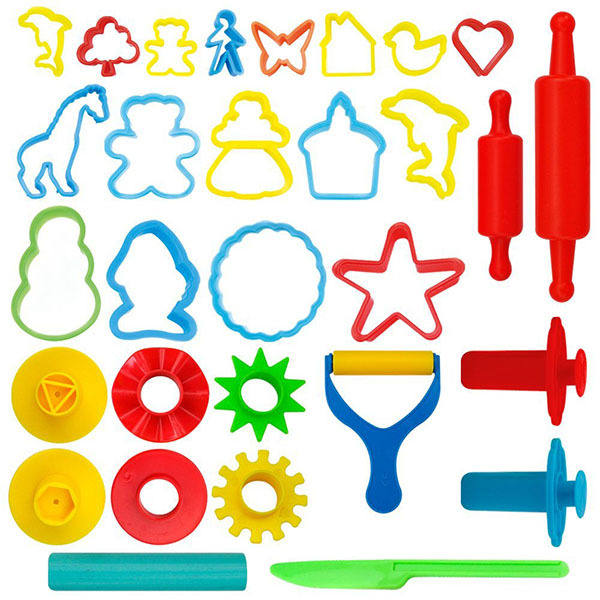 The 24 pieces include a mini rolling pin, stamps, cookie cutters, molds and dough extruders. Playdough playdates and parties are a great and cheap way to get kids engaged and playing together. If you are planning a playdough play date or party, consider getting many tubs of Play-Doh to avoid fighting among the children. The variation of colors will also allow more creative ideas to emerge. They are also great as party favors. Just a word of warning- it can be diabolical to try and get Play-Doh out of the carpet so make sure you use a floor cover or limit the play area to non-carpeted parts of your house!